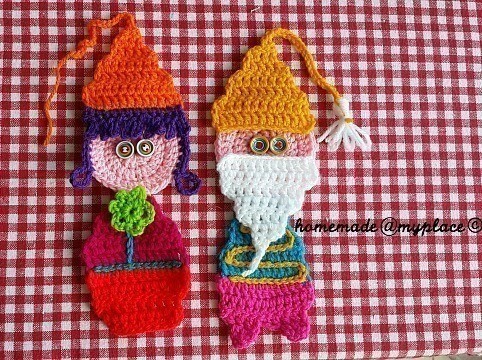 .... Who doesn't love gnomes??? They are a decorative couple, but they are good even alone! You can hang them or put together in a bunting or on a canvas! They can be used to decorate gifts or cards ! Free your imagination and use them for any cheerful occasion! 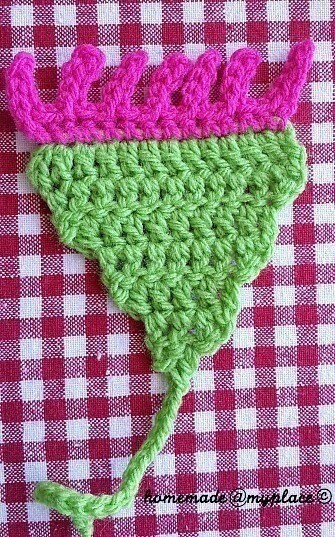 Please note that I follow US crochet terminology! Collect a 3,5mm hook and the yarn in the colour you desire. Make a foundation chain of 16 stitches. 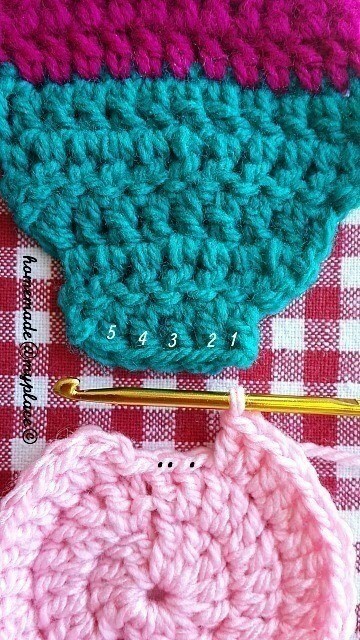 ROW 1 : wrap the yarn around the hook and insert it in the 5th chain from the hook, make 1 double crochet (DC). Make 1 DC in each following stitch. You'll have 13 DCs at the end of this row. ROW 2 : turn, chain 1 and crochet a DC in the second stitch of the row. Crochet 10 more DCs. You'll have 11 DCs stitches in total. ROW 3 : turn, chain 1 and make 1 DC in the second stitch of the row. Crochet 8 more DCs along the row. Total : 9 DCs. ROW 4 : turn, chain 1 and crochet 1 DC in the second stitch. Add 6 DCS. You will end the row with a total of 7 stitches. ROW 5 : turn, chain 1 and make 1 DC in the second stitch. Make 4 more DCs. The complete row will have 5 DCs. ROW 6 : turn, chain 1 and crochet 1 DC in the second stitch. Crochet other 2 DCS. Total DCs : 3. ROW 7 : turn, chain 1 and crochet 1 DC in the second stitch of the row. This row is complete with just 1 DC! You need to add a loop, if you desire to hang your decoration somewhere ! So, chain 25 stitches and slip stitch in the first chain of the loop. Cut the yarn and fasten off. 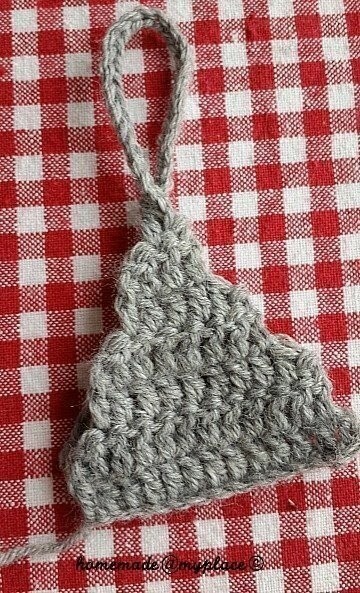 HIS HAT : follow the above BASIC PATTERN, until the end of row 7.Then, crochet 20 chains and fasten off. 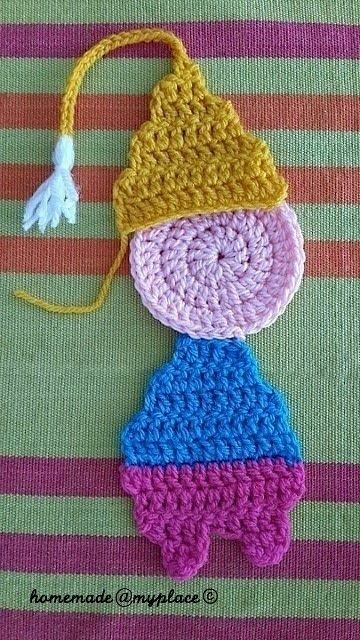 You can add a pompom or a little fringe, to complete the gnome hat! HIS BEARD : even in this case, just follow the BASIC PATTERN and reach the end of row 7. 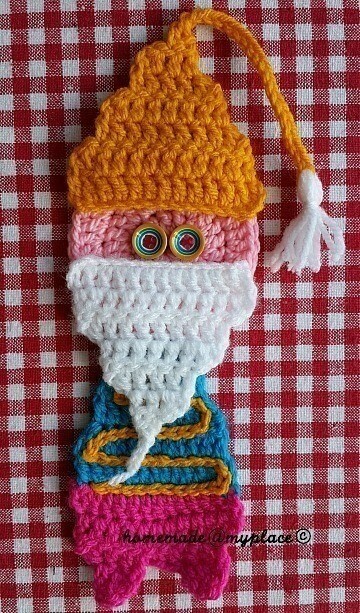 Crochet 4 chains to make a pointy beard, then fasten off. 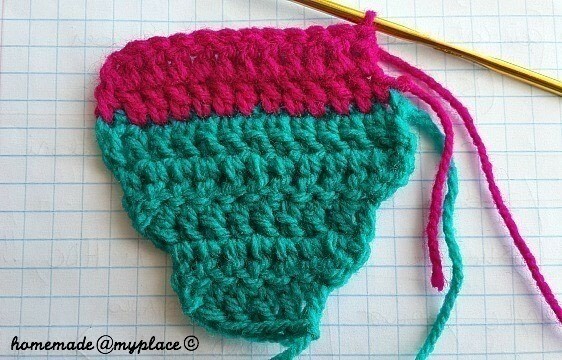 HIS TOP : follow the BASIC PATTERN, but stop at the end of row 5. You'll have 5 DCs. Fasten off. turn the top upside down. Make a slip knot on the hook with a new colour and push the hook in the first chain of the top bottom (you work keeping the front of the body right in front of you!) 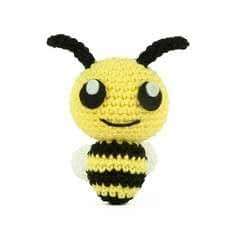 : you crochet a single crochet (SC) and then a DC in the same stitch. Continue to crochet Dcs along the row : at the end of the row you will have 13 DCs. ROW 2 : turn and crochet as in the BASIC PATTERN, You'll have 11 DCs. ROW 3 : turn, chain 1 and make a DC in the second stitch of this row. Add 3 more DCs. You will have 4 DCs. ROW 4 : turn, chain 1 and crochet a DC in the second stitch of the row. Add one more DC in the next stitch. Total : 2 DCs. ROW 4 : turn, chain 1 and make a DC in the second stitch. Crochet another DC in the following stitch. Total DCs : 2. TOP + PANTS done and trimmed! 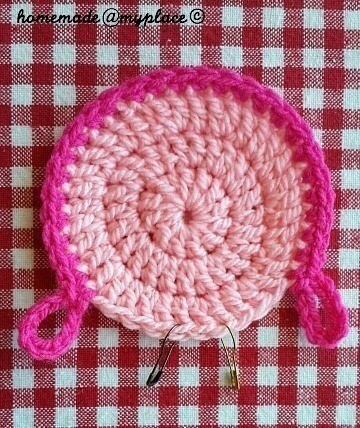 You need to crochet a basic DC circle, just made of 3 rounds. Make a slip knot on the hook and chain 4. Push the hook in the first chain and make a slip stitch to form a ring. ROUND 1 : chain 1 and crochet 12 DCs into the ring. Finish the round with a slip stitch in the top of the first DC. ROUND 2 : chain 1 and crochet 2 DCs in each stitch. at the end of the round you will have 24 DCs. Close the round with a slip stitch in the top of the first DC. 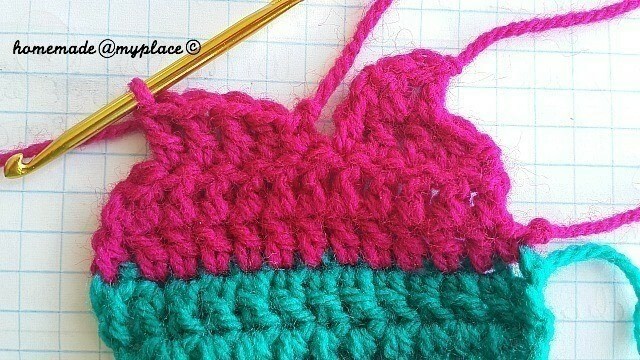 ROUND 3 : Chain 1, Make 1 DC in the first stitch while crochet 2 DCs in the following stitch. Repeat 1 DC + 2 DCs, until you reach 33 DCs done. You still need 3 DCs ( 1 DC+2 DCs) to complete this last round and you have to crochet together face to top ! HOW ? Collect both face and top and put them side by side ( keep the front of the pieces in front of you). You have to join them simply, while working the last 3 DCs of the gnome face ! 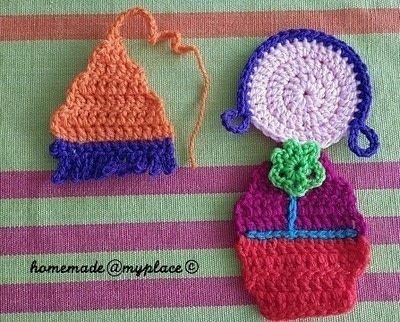 The spaces where you have to crochet the last 3 DCs are marked with 3 black dots on the gnome face. The stitches of the top you have to consider to join with are the ones marked with numbers 2, 3 and 4. START your first DC : wrap the yarn around the hook, insert the hook in the stitch (first black dot), wrap the yarn around the hook and pull it back trough the stitch. You have 3 loops now on your hook. Wrap the yarn around the hook and pull it through the first 2 lops. Half DC is done. Insert the hook in the middle of stitch number 2 of the top (see pic), wrap the yarn around the hook and pull it through the 3 loops ! Your DC is done and the first join is made, too! Repeat the same for the other 2 DCs. When completed the join, make a slip stitch in the first DC of the 3rd round of the face and fasten off ! Position head, beard and buttons where you like most and then sew on all the pieces !!!! If you don't like to see all the threads on the back of the gnome head, just cut a circular piece of felt and sew it around the face with the lovely blanket stitch! If you like, you can even embellish the gnome top using some chain stitches !!!! "HE" GNOME IS READY ! 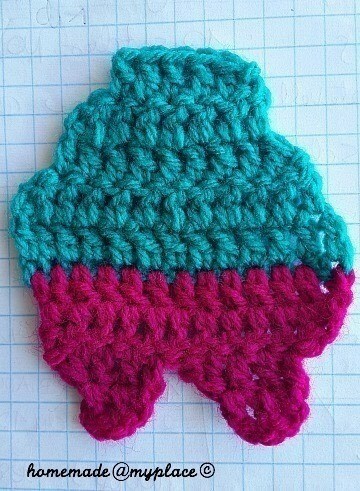 HER HAT : Follow the BASIC PATTERN until you reach the end of row 7. Then chain 20 stitches, cut the yarn (leaving a tail of 5/6cm) and fasten off. HER TOP : follow again the BASIC PATTERN, but stop at the end of row 5. You'll have 5 DCs. Fasten off. HER SKIRT : follow steps 3 and 4 of the gnome pants! 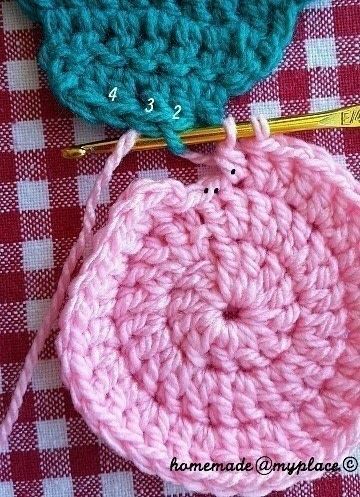 So after the second row, crochet ROW 3 and ROW 4, that are identical : turn, chain 1 and crochet 1 DC in the second stitch of the row. Crochet 8 more DCs along the row. Total DCs : 9, for both rows. Fasten off at the end of row 4. Pick a nice vibrant colour for the hair. Make a slip knot on the hook, crochet 10 chains (leaving a long tail, useful to give shape to pony tail later) and insert the hook in any stitch of the face. Make 1 SC, then add 26 SCs along the curve of the face. Chain 10, make a slip stitch in the last SC, cut yarn and fasten off. For the other pigtail, thread the tail in the yarn needle and let it trough the back of some SCs. Trim in the end. 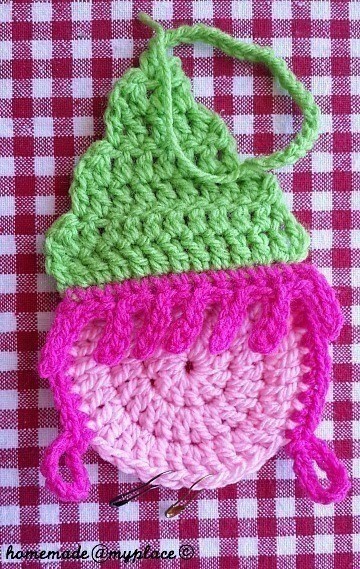 Collect the "SHE" GNOME hat and put it upside down, with the back of it in front of you. 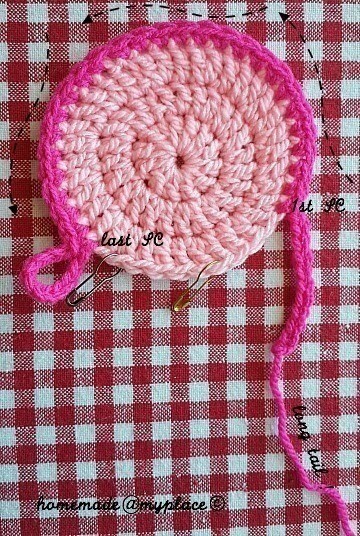 Pick up the same colour used for the hair before and make a slip knot on the hook. Push the hook in the first stitch (its base) and make a SC. 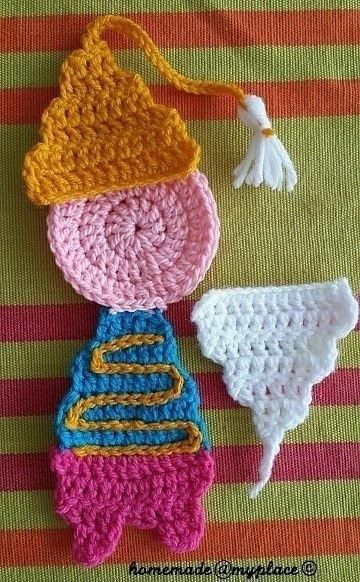 Crochet other 12 SCs. First row done. 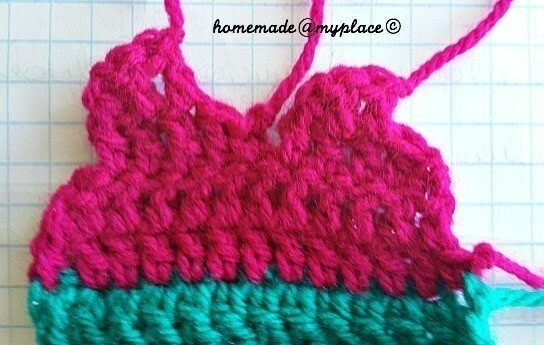 Chain 4, insert the hook in the 2nd stitch from the hook and make a slip stitch. Make 1 slip stitch in each of the following chains (=2). Make a slip stitch in this first SC. 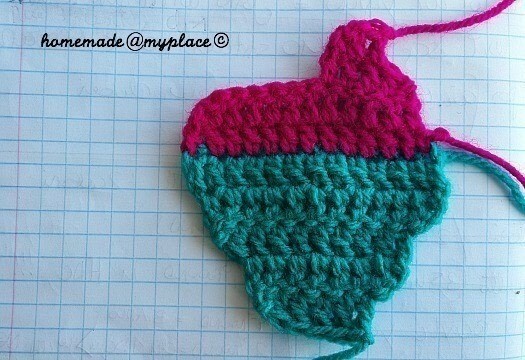 Crochet 1 slip stitch in the second SC and another one in the 3rd SC. In this 3rd SC, chain 4 and repeat what we have done in the first SC. You repeat this pattern until the end of the row. 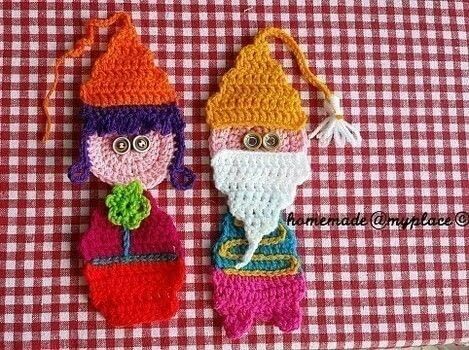 As for the HE GNOME, collect all the pieces and sew them on, buttons included. 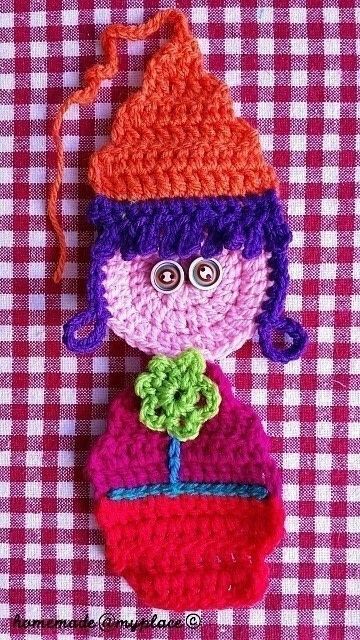 You can add some chain stitches and a little flower on the top of this little lady : make a slip knot on the hook, chain 4 and slip stitch in the first stitch to form a ring. [Chain 5 + 1 SC] 6 times. Fasten off and trim in the ends!